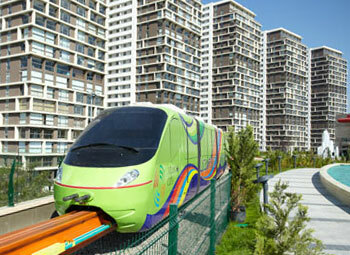 A minirail shuttle operates between a Metro station and Atlantis City, a condominium/shopping center development in Western Ankara. The line operates primarily at ground level, except for a road crossing at the mid-point turn between the complex and Metro station. The track surface has a unique 'diamond plate' metal floor texture. The system was provided by Beijing Shibaolai Amusement Equipment Co. Ltd.